Dan Servodidio offers up his best bets for the Final Four in the NCAA Men's College Basketball Tournament. After months of taking over’s or laying the points or regretting those parlays, we’ve come to the final weekend of the college basketball season! The Final Four gets underway on Saturday with Auburn-Virginia tipping at 6:09 pm ET and Michigan State-Texas Tech following up at 8:49 pm ET. Each day during the tourney, we’ve highlighted a couple games or lines as the “Best Bets” with interesting point spreads and over/under’s that we can take advantage of. The numbers are all the current ones according to the Bovada Sportsbook. Over the first four rounds of the Big Dance, we are now 10-6 with our highlighted suggestions - including notable first-round calls of Yale (+7 over Yale), Murray State (+3.5 over Marquette) and UC Irvine (+4.5 over Kansas State). Placing any money on this game is risky because it could go one of two ways - but the spread moving further in Virginia’s favor after opening at +5 makes the Auburn bet very interesting. Virginia’s stellar defense and ability to slow the game down is definitely scary to go against - yet this Auburn team has shown unique resilience despite playing without one of its best players lately. Since Chuma Okeke tore his ACL in the Sweet 16, the Tigers went on to beat UNC by 17 (as 5.5-point underdogs) before clinching a Final Four berth with last weekend’s 6-point overtime victory over Kentucky (as 5-point dogs). Auburn has been able to survive by rotating its frontcourt while leaning on guards Jared Harper and Bryce Brown on the offensive end. Virginia has strong guard play of its own with not much talent down low outside of Mamadi Diakite’s breakout. 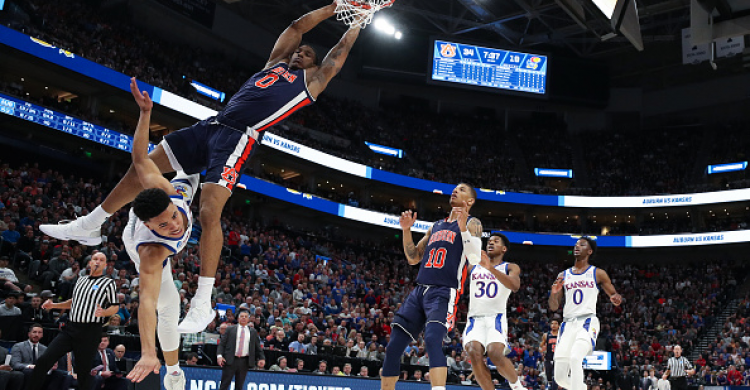 The absence of Okeke on Saturday won’t play as much of a factor for Auburn as it should have against Kentucky in the Elite Eight - and we all saw how the Tigers covered then. There is a small risk that Auburn goes cold shooting-wise, Virginia’s defense proves too tough and the Cavs win by more than 10. Still, Auburn is in the midst of a 12-game winning streak and head coach Bruce Pearl should have his team ready to go in this one to at least keep it close. Although both teams in this game can score 80+ points if needed, there’s a real possibility we don’t see either squad crack 60 points as this matchup will be dominated by the defense. According to KenPom, Texas Tech boasts the nation’s top-ranked defense while Michigan State’s D is 9th in the country. Both sides tend to play slower than average and force opposing offenses to use up the entirety of the clock while utilizing tight man-to-man coverage. The Red Raiders showed they can play faster with the likes of Buffalo and Gonzaga - but Michigan State is simply not that type of team. Spartans’ head coach Tom Izzo will have his team so prepared for this matchup that they won’t force up bad shots on offense or make many turnovers. Instead, the offense - led by Cassius Winston - will work the shot clock until they get the perfect shots because one bad possession or one bad turnover is usually the difference between winning and losing vs. Texas Tech. On the same note, though, Jarrett Culver will run the Red Raiders’ offense with efficiency and a slower pace because the same can be said about Michigan State taking advantage of one bad possession. Both teams want to control the pace in this game - and that pace will likely be a slow one. Take the under and hope it ends in regulation! If you're a DFS (daily fantasy sports) player, you should check out Dan Servodidio's game breakdowns and recommendations over on Fantasy Alarm.